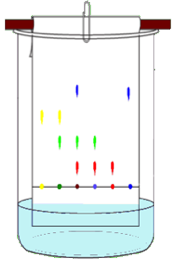 Chromatography can be used to separate mixtures of colouredfoodmixturespaperratesseparatessolvent compounds. Mixtures that are suitable for separation by chromatography include inks, dyes and colouring agents in colouredfoodmixturespaperratesseparatessolvent . Simple chromatography is carried using chromatography colouredfoodmixturespaperratesseparatessolvent . A spot of the mixture is placed near the bottom of a piece of chromatography paper and the paper is then placed upright in a suitable colouredfoodmixturespaperratesseparatessolvent such as water. As the solvent soaks up the paper, it carries the colouredfoodmixturespaperratesseparatessolvent with it. Different parts of the mixture will move at different colouredfoodmixturespaperratesseparatessolvent . This colouredfoodmixturespaperratesseparatessolvent the mixture out.